Can Your Kids Be Honest With You About Their Struggles with Faith? I’ve read it way too many times. A sobbing mother (or father) is distraught because their child has abandoned Christianity soon after leaving home for college or university, or to take a job. The child had been raised in a Christian home. They had gone to Youth Group, Sunday School, Quizzing, Christian School, Christian camp, Christian clubs, etc., etc. Nothing had appeared to be wrong with their faith. The parent is obviously shocked and devastated, and who wouldn’t be? There are probably as many answers to this question as there are prodigal children. But one answer might be that the ‘outside’ view of this child’s faith didn’t match the ‘inside’ reality of that faith. Let’s be honest, can your kids be honest with you about their struggles with Christianity and God? Or do you either dismiss or freak out over their struggles? Here’s a simple object lesson involving painted Easter eggs (or some rotten compost if you’d prefer) to open up dialogue and invite your children to come to you with their struggles about their faith. – Eggs. Decide how many you want per child. Make sure there is at least one for you to decorate, and do not hard boil or empty out that egg. – Paint, stickers, glue, ribbon, markers, tissue paper, glue, etc. to decorate the eggs with. The ones in the picture above have cut out pieces of tissue paper glued to them. Spend how ever long you’d like decorating your eggs. 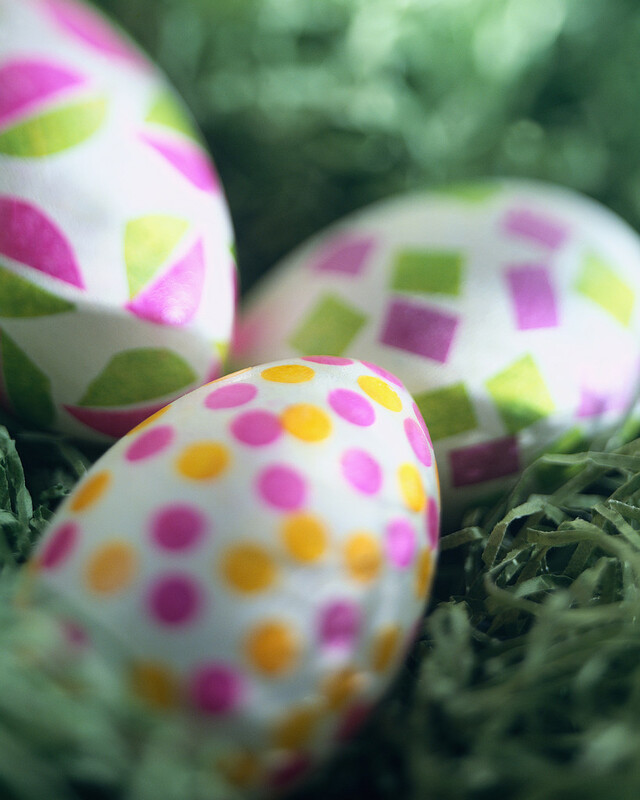 At least one egg should be decorated by you. Make it look as nice as you can. Once you’re done and all the eggs are sufficiently admired, tell your children that these eggs can be a lot like Christians. Some Christians think that as long as they look good on the outside, that’s all that matters. Some Christians are afraid to tell others about their failings, fears, struggles or doubts about God or their faith. But God tells us that what really matters is how we look on the inside. Read: Luke 16:15 and 1 Sam 16:7 (give your children the context for this story as well). What part of a person do people see? What part of a person does God see? Which is more important – who we are on the inside or on the outside? At this point, crush or crack the egg that you decorated. Or, have one child open the gross compost ‘present’ that you wrapped. It’s easy for us to try to look good on the outside – just like this egg did. Many people like to hide the doubts or questions that they have about God – the messy inside of themselves. They might think that they can’t ask those questions to anyone. Have you ever felt like that? If you as a parent have had or currently have a fear or struggle with your faith, you could consider sharing it with your kids at this point. Then tell your kids that it would be strange if they didn’t have fears or doubts about their faith at some point in their life. Tell them that you want them to know that they can be open and honest with you about these doubts and questions. When we did this, we explained that God put us in a family to help each other, and that we wanted to help our kids when they had challenges to sort out. We also explained that we (my husband and I) also need help sometimes to understand and manage our fears or doubts, and that we do this by talking about them with each other. Find ways to check in regularly with each other about how your kids are doing with God and their faith. You could ask them if their insides match their outsides, or if they feel more like the outside of the decorated egg or present, or the inside today. When something happens that could be challenging to your child’s understanding of God, actively bring it up with your child. Be open about your own struggles and how you have found a way through them (or how you are currently struggling with them). Don’t assume everything is great just because your children don’t mention that they have doubts. Resist the urge to jump on your child’s doubts, or to ridicule or diminish them. Just because your child has a doubt or a struggle that you don’t personally struggle with does not mean that it isn’t important – maybe hugely so – to them. Find answers and discuss them without preaching. If your child does not think they are being heard or respected, they won’t come to you and you just might be horribly surprised one day. I’ll be blogging more on this in the future. If you have ideas or experience in how to encourage honest discussion about doubts with your children, please share them!